Interested in Turkish cuisine? Want to learn a little about the history of Turkish cuisine? Perhaps you’re looking for some popular Turkish dishes? Our guide to Turkish cuisine gives you the facts & information you want to know. The cuisine of a particular region reflects on the character of the people and the lifestyle of its inhabitants. The cuisine itself is influenced by the various nations that have impacted the particular region. This is why we find most regions to have had developed their own cuisines through a fusion of the cuisines of the nations that it has come into contact with. When we study the history of Turkey we realize that the Ottomans were the foremost in asserting their influence upon the cuisine of the country. But there were other nations like the Hattians who ruled the land as far back as 2500 B.C. The geographical location of any region is bound to influence the cuisine as that is what decides what kind of food will be available to the people of the region. Turkey is a country that has all the seasons and different areas have different weather patterns. The huge coastline brings in a lot of fish which is but naturally incorporated into the regular diet of the people. Bread is another important item in the Turkish cuisine and the origins of its cultivation can be dated back to the nomadic times. The Turks are also quite fond of meat in the form of kebabs and of course the dairy products continue to be a popular source of nutrition till this day. Since the Muslims had ruled over Turkey for over 600 years it is but natural that the real Turkish cuisine developed during those long years of the Ottoman Empire. The chefs developed great skill in trying to please the rulers with exquisite cuisine for the royal palate. 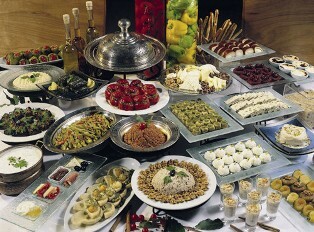 Thousands have new dishes sprung up in this era resulting in the expansion of the Turkish cuisine. Since turkey is in very favorable location when it comes to trade many travelers and traders had the chance to come here and play their part in influencing the cuisine of the region. The North African influences on the Turkish is quite obvious when we look at the wide spread use of sweet peas, fruits and nuts with meats. The Sultans had complete control over the spice roads of the region. This meant the easy availability of these spices which were freely incorporated into their cuisine. The location of Turkey is also the main reason of the wide variety of fresh produce that is found in the region. The regional differences in cuisine continue to exist due to the large size of the country with the people of the hot regions in the south east taking to extra spicy foods and the temperate lands tend to have more fish and olive oil consumption. Dairy products, meat and cereals are quite popular in the Eastern side which is the coldest region of the Country. Although the Ottoman era has ended their influence on the cuisine of the region still largely remains. Continuing the legacy of the Muslims you will find Turkey still regards rice and wheat based goods to be the main staples. There have been some additions from neighboring countries such as Greece but the cuisine of Turkey is still pretty much the order that was formalized during the Ottoman rule.